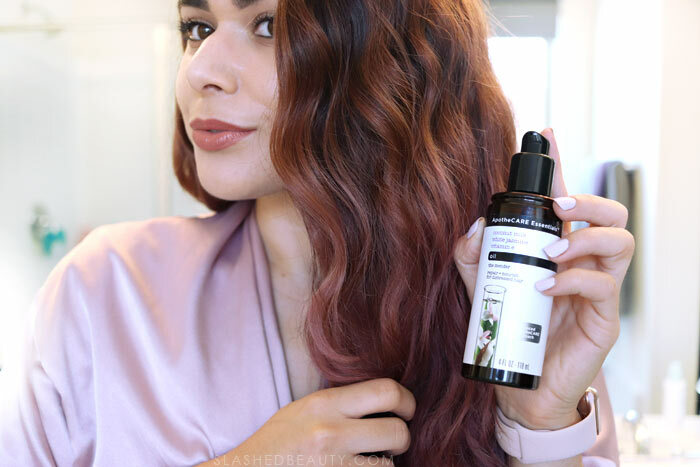 My summer hair care routine for colored hair does differ from before my hair was colored. I’ve definitely been more picky about what I use… I have to! I want to maintain as much color as possible when I wash, and also need intense nourishment. 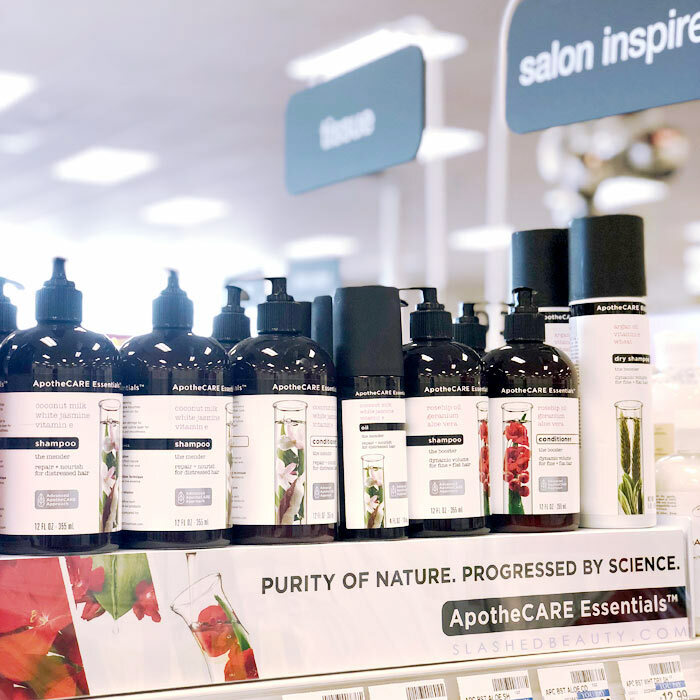 On my latest trip to CVS, I saw a display for the new ApotheCARE Essentials brand, which focuses on high-quality ingredients and leaving out the unnecessary ones. I was super excited that they had a specific product line for color treated hair called The Colorist. 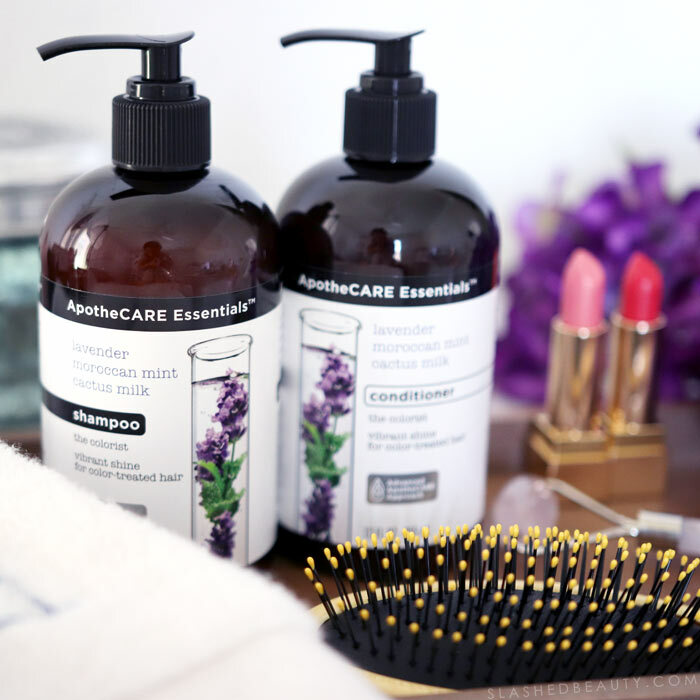 So, I took home the ApotheCARE Essentials The Colorist Shampoo & Conditioner, which is made with lavender, moroccan mint and cactus milk. The formula works to boost shine and make your color look vibrant. All of the brand’s formulas are made with the Advanced ApotheCARE Approach, which is a 3-step process to select effective ingredients from nature, extract the essence and nutrients, and slowly infuse it to maximize the quality and maintain their power. 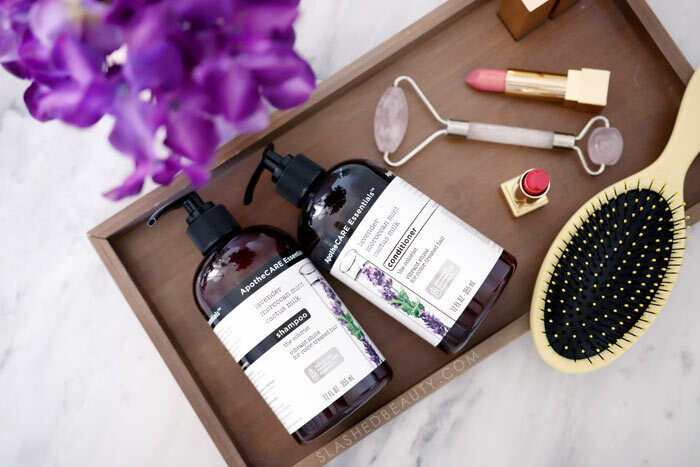 There are a ton of plant based ingredients in the products, and no parabens, no dyes and no silicones. I absolutely love the smell of this shampoo— it reminds me of being in the salon. The scent is so refreshing and relaxing, and it has a thicker consistency so less is more. The conditioner is a little milder on the fragrance, and lightweight… but don’t let that fool you. I let it sink into my hair for about 5-10 minutes while I do other things like exfoliate and shave. When I rinse my hair, I can tell right away that it’s more hydrated than when I started. Some tips for washing color-treated hair: It’s best to wash a little less often than natural hair. Dry shampoo will be your best friend. Also, avoid hot water, as it can wash your color out more quickly. I’ve been washing about 1-2 times a week depending on how hard I’m hitting the gym. I notice less color going down the drain with these tips and products. Because I want to maintain as much moisture in my hair as possible, I’ve been laying off the heat styling recently. So after my shower, I wring my hair out with a hair-friendly, micro-fiber towel. Then, I use the ApotheCARE Essentials The Mender Oil, which is designed to repair and nourish distressed hair with coconut milk, white jasmine and Vitamin E. This oil smooths my cuticles and will add even more shine without a greasy residue, also making it perfect for every-day touch ups. This makes my hair smell AMAZING with a warm jasmine fragrance that lasts all day. I like to do heatless waves by wearing my hair in braids or twists as it dries. Once I let my hair down, I might add a drop of more oil to my ends for another little touch of hydration. I’m left with hair that looks and feels amazing. It feels like a post-salon wash without the salon price tag every time. 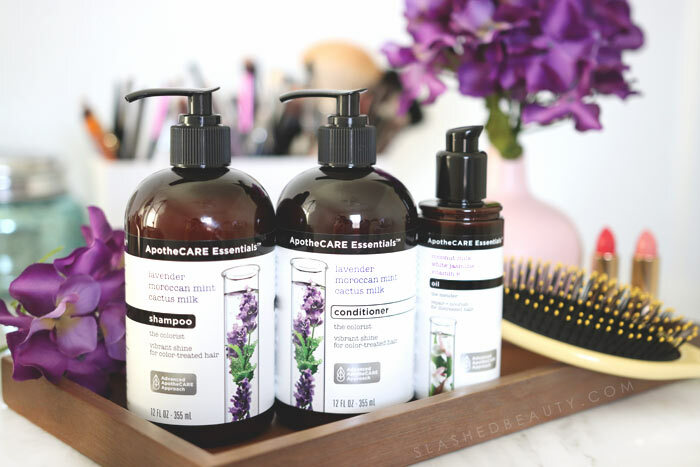 It’s funny how sometimes you just have to go simple to find the best results— and from the minimalist packaging to the straight-forward ingredients, ApotheCARE Essentials is a simply smart choice to keep my hair healthy this summer… especially in this dry climate! 5/20: BOGO Free on Apothecare!! How do you care for your color treated hair differently in summer? For my colored hair I always wash uncool water like I do my face and I’m constant loading down on the silk leave in serum . I just love the smell and it doesnt leave my hair oily and gives it a great shine and smooths all my ends leaving my hair friz free .i like to use gloss shampoo and conditioner rated #1 with allure this year and it’s amazing leaving my hair full of body and everyone is always asking me what did I do to my hair that it looks amazing:). That sounds awesome!! Thank you for sharing! Your hair looks amazing!!! I haven’t colored my hair in about two years and getting the itch, I will have to keep this line in mind for keeping my color rich. 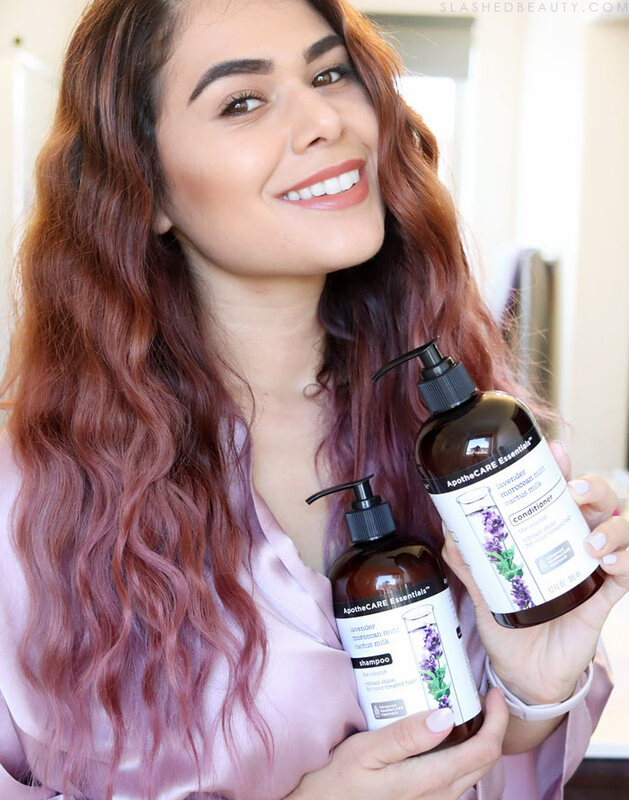 I’ve been looking for a new shampoo and conditioner so I’m definitely going to go check out this brand! The ingredients sound amazing! Do you know if the brand anywhere other than CVS? I don’t have a CVS in the whole state! I totally want to try this line – it sounds amazing! I always take a break from dyeing my hair in the summer, but these tips might make me change my mind about that! I’ve never seen this in CVS. I’m going to look next time I’m in there. I’m getting my hair done tomorrow, so I’m definitely going to need something extra for color-treated hair. This post came just in time! I love the purple/pink in your hair. It looks amazing. I wish my hair was as long and as thick as yours! Those scents sound absolutely wonderful! I’ll have to keep an eye out for them. I had no clue that warm water takes color out. I haven’t colored my hair in about year, but when I head back I need to follow some of your advice to make my color last longer. Your regimen is similar to mine (I have natural 4c hair). Even when I used relaxers, I used a lot of products meant for color treated hair because it would add lots of moisture! I’ll have to check out the conditioner. You might want to think about doing a protein treatment too…I do one every 3 months or so. Your hair and color look so beautiful!!!!! Your new hair shade is so summery. I have had to cut back on washing too so that color doesn’t fade. I haven’t seen this yet at CVS. Yes, I’m trying to cut down to about once a week but it’s hard because I work out every single day! I want to try this brand soon, although my stylist recommended I use a purple shampoo. So I use that and a color safe, sulfate free conditioner! This one would be perfect. I have virgin hair so luckily I don’t need special shampoos but these look great! Can we talk about the hipster chic packaging for a moment? LOOOOVE it. Right? Reminds me of The Ordinary a little bit! This new brand is on my list to try soon. Your new hair color looks great!